I think I’ve probably mentioned before that before we moved back to Iowa I was in the printing industry. We originally moved to California in 1995 for a job offer that eventually turned into an opportunity to purchase part of the company I worked for. Believing in the industry, the future and my own abilities, it was a no-brainer decision. Our company printed on plastic for the credit card industry. Whether it was ATM cards, hotel key cards, casino VIP cards, library cards or college student ID’s, they all were the same to us. Little pieces of plastic that would eventually be personalized by the bank, library, college, etc. with your name, photo and account information. We produced millions of cards every year and only represented a small fraction of the overall market. One thing I became accustomed to was adhering to color specifications set forth by the client. Everyone sees colors differently, including some who cannot see certain colors at all. How would you describe “blue” to someone on the phone? How about “black”? Unless you have seen a similar color and have something to compare it to, it is an impossible task. Back in the 1950’s a printer in New York City developed an in-house system of classifying their pigments and colored inks to help simplify the communication between them and the client. This eventually developed into what we know today as the Pantone Color Matching System (also called the Pantone Matching System, or PMS for short). PMS is a system for visualizing and reproducing exact colors. No matter how you see a shade of red, if I’m looking at the same PMS number in the “book”, even if it appears differently to me, when reproduced, it will look correct to you. This was a major step forward in the printing industry and is still used today, even after the transition to digital artwork and printing technologies. Every company who has a logo or trademarked product has a PMS color called out as part of their specification. NAPA Autocare calls for PMS Reflex Blue and PMS 123. Lowe’s is PMS 280, PMS 200 and Black. And Walmart specifically asks for PMS 285 and PMS 1235. While these numbers mean nothing to the average consumer, anyone within the printing industry will immediately recognize the color family and shade just by the numbers used. I used these color classifications day in and out for a decade and a half, so much so that they are still second nature. 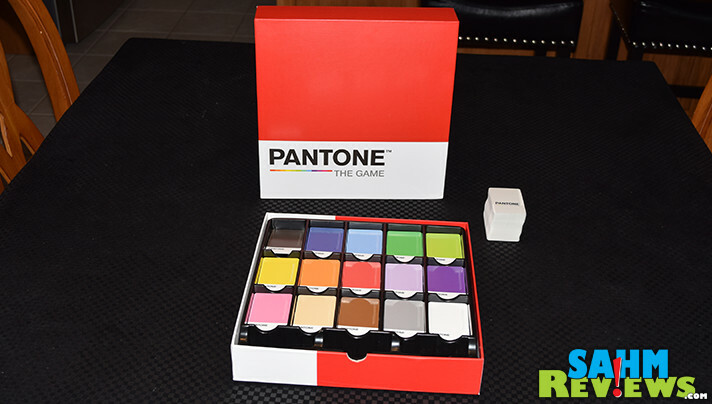 When I heard rumor of a board game themed with the Pantone Matching System, I couldn’t have been more excited. Truth be told, it could have been just a re-theme of Monopoly and I would have been first in line to pick up a copy. 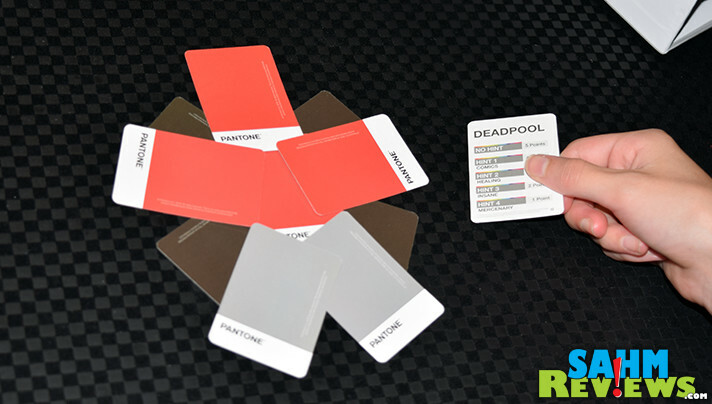 Fortunately that isn’t what Cryptozoic Entertainment was offering in their new Pantone: The Game. This game has you using some of the more common PMS colors to create artwork of your own! Included in the box are 132 Character Cards, 60 Swatch Cards in 15 of the PMS colors and a very nicely designed Swatch Card tray for easy selection of your colors. All players (up to 20!) are dealt four of the Character Cards. Everyone looks at their cards and picks one to discard, allowing for characters you may not know or think you’ll have a difficult time representing. The remaining three cards are kept hidden from other players in your hand. 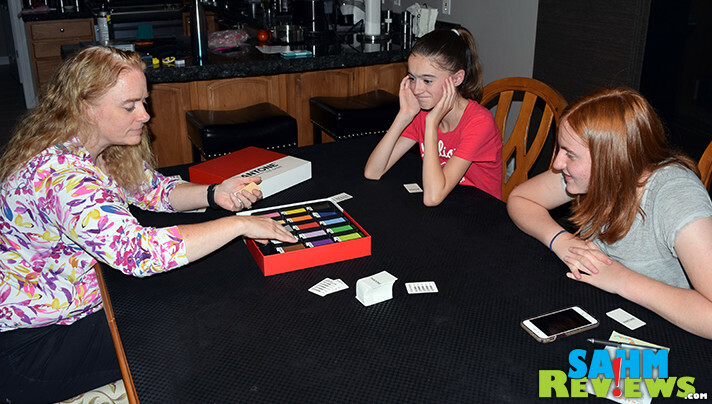 No matter how many players are present, a game of Pantone: The Game is played over three complete rounds with slightly different rules for each one. 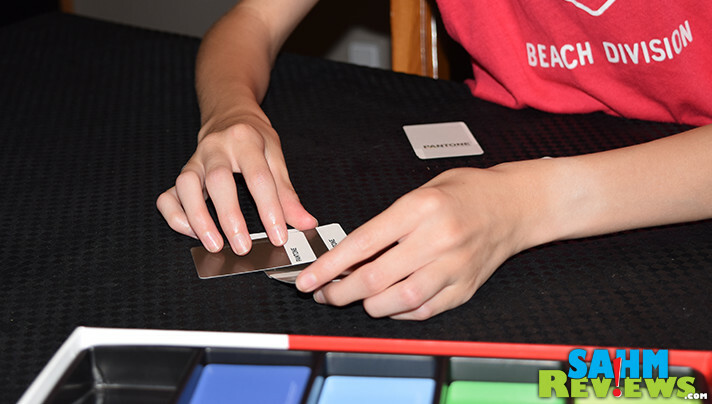 The active player (the Artist) chooses one of the cards from their hand, turns over the 1-minute timer and uses Swatch Cards to create a representation of the character depicted on the chosen card. During the first round the artist may use any number or colors of Swatch cards. 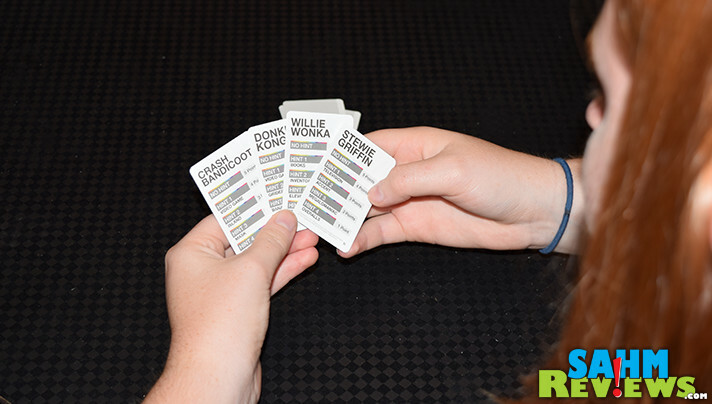 Round two limits the artist to only one maximum of each color, while the final round limits them further to three Swatch Cards in total, regardless of color! Once the representation is completed (or the timer runs out), the final depiction will resemble something like an 8-bit sprite from an Atari 2600. It may or may not resemble the character depending upon the creative ability of the Artist. But not all is lost for those of us without any artistic ability! Every player gets five seconds to take one guess at the character in clockwise order from the Artist. If someone guesses correctly, they and the Artist are awarded five points. If no one is successful, a hint is given. 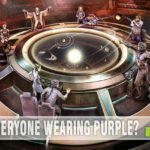 The hints are conveniently provided on the Character Card and another guess is provided to all players once revealed. If guessed with just one hint, four points are won for both the guesser and the Artist. Up to four hints will be provided with fewer points awarded the more hints that are needed. After someone guesses the character or all hints have been exhausted, points are scored (even if zero) and the next player becomes the active Artist. Round two with more restrictive Swatch Card rules begins once everyone has had a turn at being the Artist during the first round. The two subsequent rounds are played in the exact same manner using that round’s creation requirements. You do not draw additional cards at any time, so during the second round you only have two cards to choose from. Obviously your last card will be the one you must attempt during the final round. At the end of three full rounds, the player with the highest point total is the winner of Pantone: The Game! Advanced play modes are included that limit the Artist to only 30 seconds, only using three cards in every phase or even not allowing the Swatch Cards to touch each other! If you’re looking for a shorter game because there are a lot of players, simply agree to play until one player achieves a preset score (usually 20 points). I guess you could call Pantone: The Game a drawing game for those of us with no artistic skill. The unique abstract results of creating a character with pixel-like swatches is challenging, but in a good way. We only have a couple complaints about the game, one valid and the other personal. First, the inclusion of a timer would have been nice instead of having to rely on someone’s app on their phone. 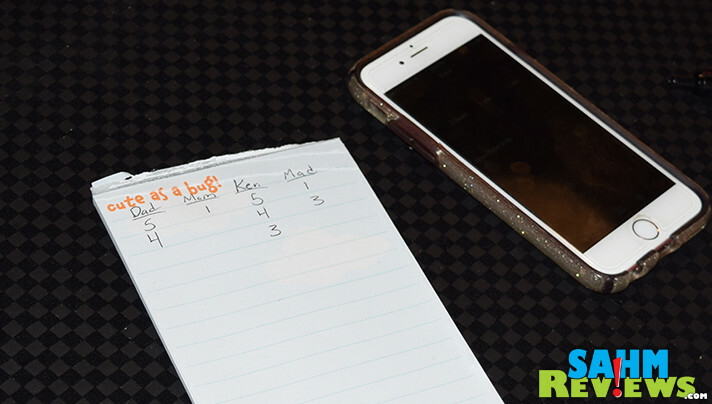 For that matter, a score sheet and pencil as well. 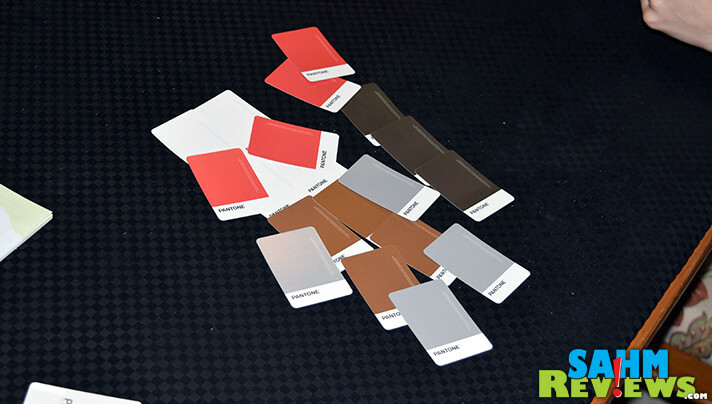 My professional ‘tick’ is that the Swatch Cards do not have their corresponding PMS colors printed on them like you would find on a traditional Pantone swatch/chip! To me this is an oversight that doesn’t affect the experience for regular players. But for anyone remotely associated with the graphics industry it will be something to obsess over. Pantone: The Game is currently available for preorder on Amazon with an August 22nd release date. It was also prominently featured in our Games Debuting at Gen Con list as Cryptozoic Entertainment will have a limited number of copies available there for purchase! Another on our personal must-buy list, not just for the theme, but for the number of players the game supports. Finding good party games for larger groups is getting harder and harder, and Pantone: The Game paints the perfect picture! 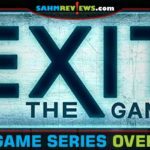 What’s next from Cryptozoic Entertainment? You’ll have to stay tuned to see what’s next or follow them on Facebook and Twitter to get the scoop before we do! What is your favorite color? Do you know its Pantone number? This game would cause major battles in my house. My husband was an art major and we used to have full out argument over whether or not our chair was orange or pink. Seeing that you don’t have to be artistic, I might give it a try. I can’t do anything that requires me to be too artsy. Overall looks fun! How can Cryptozoyc have a license and commit that kind of failures? I’m not a designer but a gamer wanting to have designer friends to play with me, so they will deny to read the wrong Pantone colors. As you quoted, I would have liked it to have the actual PMS colors printed on them. However, I can completely understand why they did not. 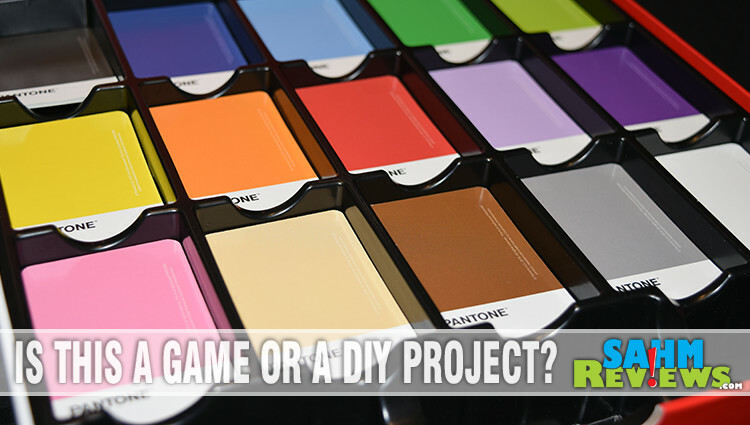 First, it would have required printing those chips with Pantone-approved ink, greatly increasing the cost of the game. And if they didn’t, and had put the numbers on them, they wouldn’t have been true PMS matches since they are printed with 4-color process inks. Pingback: Look Out! 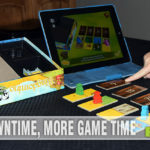 Here Comes Jellybean Games! Definitely have to think in color abstracts! I just got this game and there is a serious flaw in the rules. In a two person game, both players get the same amount of points in any situation making a win impossible.